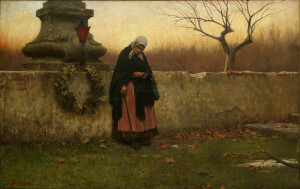 All Souls Day, by Jakub Schikaneder (1855–1924). O God, the Maker and Redeemer of all believers: Grant to the souls of the faithful departed all the unsearchable benefits of thy Son’s passion, that in the day of his appearing they may be manifested as thy true children; through the same Jesus Christ our Lord, who liveth and reigneth with thee and the Holy Ghost, ever one God, world without end. Amen. O God, the Creator and Redeemer of all the faithful: Grant unto the souls of thy servants and handmaids the remission of all their sins; that through devout supplications they may obtain the pardon they have always desired; who livest and reignest with the Father and the Holy Ghost, ever one God, world without end. Amen.